For any event any occasion, birthday flowers, get well flowers, plants, and more. Welcome to fullerton florist, where we take great pride delivering flowers. Our dedication is proven through our prompt service and beautiful floral arrangements. Our florists choose from a vast array of the flowers maintained daily to make certain your floral arrangements look their best. Flower arrangements for any occasion including wedding flowers, funeral flowers, gifts, plants and more. Please call 714-529-2747 if you need a custom design. Trust fullerton florist for a perfect amount of creativity and professionalism delivering you a full service. With 2 dozen roses you are sure to make quite an impression and will make any occasion perfect. Roses come with a glass vase included. Roses are available in pink, yellow, red, white or peach. The "Sweeter than Ever" bouquet with chocolates is perfect for any occasion. The dramatic colors and freshness will create a remarkable gift. Flowers included are pink carnations, lavender chrysanthemums, pink gebera daises, lilies and lush greens that are situated perfectly within a clear glass vase. This special bouquet of flowers will definitely brighten someones day. 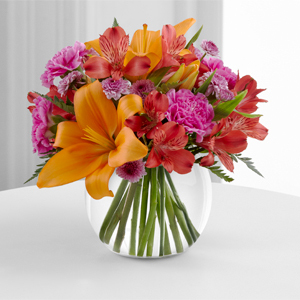 The combination of oranges, pinks and red are resting within a clear glass bubble bowl vase to deliver your sweetest sentiments around the Fullerton area. Contact Fullerton Florist for flower delivery and floral arangements in Fullerton, CA.